Effective veterinary branding communicates all that your veterinary hospital represents, not just the state-of-the-art, brick-and-mortar building, but also your philosophy and the excellent care you provide. Veterinary branding, if done effectively, is the obvious answer to why a pet owner chooses your practice over the competition. Branding doesn't happen overnight. It requires a thoughtful strategy that interlinks all facets of your veterinary hospital. MACRO (yourself, your staff, your product, your services) + MICRO (website design, mobile site, logo, consumer audience, etc.) = BRAND. At VetNetwork, we are experts at helping you define your unique veterinary hospital brand and showing you how to use it as an important promotional tool that grows your business. 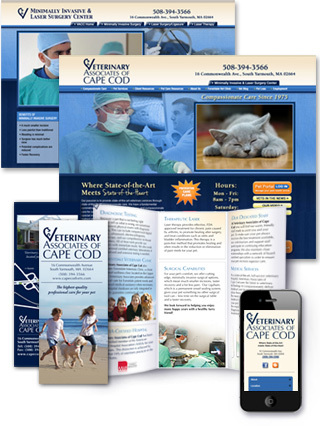 We are ready to work with you so that your veterinarian marketing brand is your spotlight – one that your clients (and prospective clients) cannot miss. Call us at (800) 564-4215 or contact us online to learn more today.